Princess Durru Shehvar ushered modernity into Nizam’s household. The name of Durru Shehvar, the elder daughter-in-law of the Nizam of Hyderabad, Mir Osman Ali Khan, is remembered for the social and philanthropic work she so zealously engaged in Hyderabad. Born in Turkey, brought up in France but married to the son of the world’s richest man, the Nizam of Hyderabad, Princess Durru Shehvar chose to spend her last years in London. She brought modernity to the Nizam’s household and worked for the upliftment of women in Hyderabad. 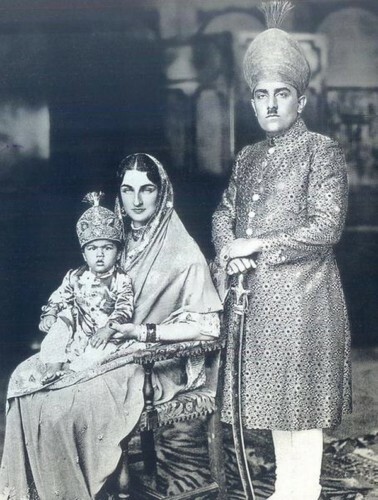 Her marriage with prince Azam Jah Bahadur, the elder son of the seventh Nizam, Mir Osman Ali Khan, resulted in the union of two illustrious Muslim families, the Turkish Caliphate and the Asaf Jahis of Hyderabad. Durru Shehvar, the only daughter of Abdul Majjid II, the Caliph of Turkey was born in 1914 and brought up with modern education, training in martial arts and was intended to succeed her father. In March 1924 after Turkey became a Republic, the Caliphate was abolished and the royal family expelled. Abdul Majjid and his family settled in Nice, a southern French Mediterranean port city. The British Red Cresent Society, friendly with the deposed ruler appealed to Muslim rulers around the world to come to the aid of the impoverished Caliph. Persuaded by Maulana Shaukath Ali and his brother, Maulana Mohammad Ali, Nizam Mir Osman Ali Khan decided to send a life-time monthly pension of 300 pounds to the deposed Caliph, and allowances to several individuals in the family. When Durru Shehvar, came of age, she was sought in marriage by several Muslim Royals including the Shah of Persia and the King of Egypt for their heirs. Shaukat Ali prevailed on the Nizam to send a proposal to the Caliph asking for Darru Shever’s hand for his elder son, Prince Azam Jah. The deposed Caliph could hardly reject the offer from his benefactor. But it was not that easy; the Mehr (the bride money) of 50,000 pounds that the Caliph demanded for his daughter was “too big”, the Nizam felt. But with the intervention of Shaukath Ali, the Caliph proposed to offer for the same Mehr, the hand of his brother’s daughter Niloufer, for the Nizam’s younger son, Prince Mauzam Jah. The Nizam readily agreed and sent his two sons to France. The marriage of Princess Durru Shehvar with Prince Azam Jah, along with that of Prince Mauzam and Niloufer took place in Nice, in France, on 12 November, 1931, in a simple ceremony attended by only a simple affair with only the members of Sultan’s family at Nice, a few Turkish nobles and friends as well as representatives of the Nizam — Sir Akbar Hydari and Nawab Mehdi Yar Jung, who happened to be in Europe at that time to attend the Round Table Conference. The Khalifa himself performed the ceremonies. All the offices and educational institutions in the Nizam’s dominions were given a holiday on the day. After a month of festivities in Nice, the Princes with their concerts set sail from Venice to India on December 12, 1931. The ship they were travelling in also contained a star co-passenger, Mahatma Gandhi, who was returning after attending the Second Round Table conference in London. Shaukat Ali, who was accompanying him, having known Gandhi’s sympathy for the exiled Caliph for whose restoration, he pleaded during his non-cooperation struggle, arranged a meeting of the young Hyderabadi Royals with Gandhi on the board of the ship. ALSO READ: Will TDP Supremo Chandrababu Naidu Wins The 'Lonely Political Battle' In Andhra Pradesh? However, there was a hitch Gandhi who was traveling in III class would not step into Ist. class where the young couples stayed; nor would the Hyderabad Princes be willing to go to III class where Gandhi stayed. Shoukath Ali, worked out a compromise and the meeting of Gandhi and the newly weds took place in a lounge in the II class. In Hyderabad, Durru Shehvar soon identified herself with the people . With a great passion for providing health care and education for common people, she set up a general and children’s hospital in Purani Haveli, which still runs in her name. A Junior College for girls in Yakutpura, Bagh-e-Jahanara, is also run on the funds she provided. She inaugurated the Ajmal Khan Tibbiya College Hospital in Aligarh Muslim University (AMU) . The Nizam called her his precious Jewel (Nagina) and encouraged her to participate actively in Hyderabad’s social life. The proud father -in -lawloved to point out how Durru Shehvar was taller than his son. In the company of her friend Rani Kumudini Devi, she rode horses, drove cars and played Tennis. With her beauty and charm, etiquette and dress sense, she transformed Hyderabad’s social circuit. Durru Shehvar also laid the foundation stone of the Begumpet Airport building in 1936. Until then a small strip at Hakimpet served as the airport for Hyderabad. She ensured her sons, Prince Mukarram Jah and Prince Muffakam Jah, received the best possible western education in Europe and married Turkish brides, as she desired. Mukarram studied in Eton, where India’s first prime minister, Jawaharlal Nehru had earlier studied. Years later, Mukarram, declared heir to Hyderabad throne, at the suggestion of his grandfather, Mir Osman Ali Khan, served as Honorary Aid De Camp (ADC) to Prime MinisterNehru! Durru Shehvar was fluent in French, English, Turkish and Urdu and even contributed articles to French magazines. She believed that women should earn their own living and worked hard to remove the practice of purdah. However, there was a great gulf between the Princess and the Prince, Azam Jah and their marriage fell apart within few years. It is an irony that when she was born, her father, the Caliph was the head of all the Muslims in the world; but was overthrown and sent away in exile. After her marriage, Hyderabad state was abolished and integrated with the Indian Union in 1948. She faced fame and power as well as adversary, displacement and agony, all with equanimity, and won the hearts of the people in Hyderabad, where she spent most of her adult life. Next article#BigQuestion: Can KCR’s Head Start In Telangana Backfire On The TRS In This Elections? Telangana CM KCR Under Pressure From ‘Own Family’?